The great draw of this film is the marathon span of filming. 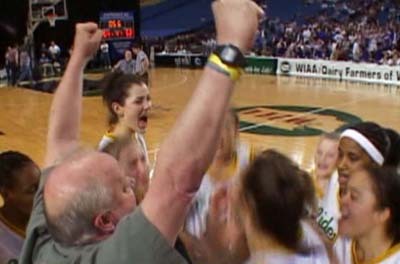 For seven years a solo filmmaker followed a high school basketball team as it tried to mold suburban girls into state champs. That perseverance pays off with deep portraits of individual girls and the coach. The inspirational genius behind the team is an unlikely college tax professor who moonlights as the team’s coach. He has a heart for the game, and can touch the hearts of everyone around him. 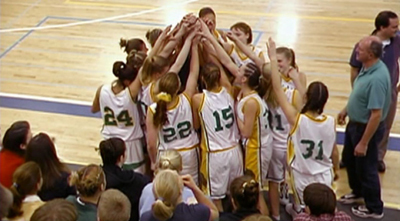 The film follows a few girls as they rise, fall, sidestep, jump ahead and mature. In particular the film stars one remarkable girl who manages to overcome incredible obstacles. It’s like the great documentary Hoop Dreams in some ways, only better. There’s more play-by-play of actual games, which ratchets up the excitement and drama at least two notches. After seven years the film concludes in a nail biting climax that seems so unlikely you’d disbelieve it if it came from Hollywood. 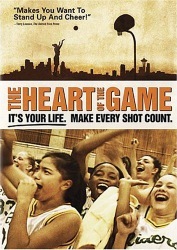 Despite all the flashy sport, theres a golden heart of wisdom at the center of this film.